The EU agri-food sector now delivers an amazing variety of products to consumers. Access to safe and nutritious food, however, is not guaranteed for all Europe’s consumers as quality and safety can sometimes be compromised and there is an increasing awareness of food poverty across society. Strengthening food and nutrition security (FNS) in the EU will, however, require more than just overcoming production challenges. It goes hand in hand with the need to ensure more adequate diets for EU consumers. The envisioned future European diets will need to contribute effectively to reversing the increasing trend in overweight and obesity and to reducing the disease burden due to diet-related non-communicable diseases (NCDs) such as diabetes, cardiovascular and malignant disease. They must also be affordable to consumers in less privileged socio-economic strata across all sub-regions in the EU, withstand food crises and accommodate cultural diversity. 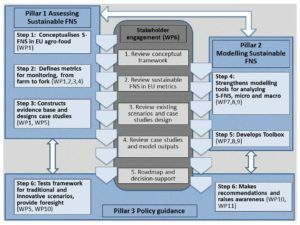 Enhanced FNS is needed, built on a scientific evidence-base and accounting for the perspectives of the producers and the actors in the food chain, as well as the factors that determine the actual dietary pattern of EU citizens. To gauge what policy reforms may best serve the upcoming challenges, a new conceptual approach is needed that explicitly shows how the food that is produced better matches consumption needs and maintains health and how this improved understanding can enhance FNS in a more sustainable way. This has led to the development of a multidisciplinary research program SUSFANS, which studies metrics, integrates modelling and develops foresight for European sustainable FNS. 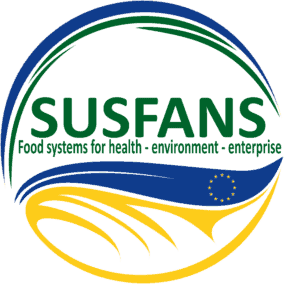 SUSFANS’ overall objective is to build a conceptual framework, evidence base and analytical tools for underpinning EU-wide food policies with respect to their impact on consumer diet and their implications for nutrition and public health in the EU, environment, competitiveness of the EU agri-food sectors and global food and nutrition security. Underpinning EU-wide farm, fish, food and nutrition policies. The detailed work programme was discussed and translated into concrete actions at the project’s kick-off meeting in May 2015. In particular, the organisation of four Stakeholder Core Group (SCG) workshops was entrusted to ILSI Europe, which is also in charge of the interactions with the SCG throughout the life of the project. ILSI Europe contributes to the work package ‘Stakeholder Interaction and Scenario Review’ as Co-Leader. The remit of this work package is to build and maintain solid and effective interactions with a broad stakeholder community throughout the life of the project. In this framework, ILSI Europe contributes to the establishment of a Stakeholder Core Group (SCG) and the organisation of four stakeholder consultations. The first SCG workshop successfully took place on 30 October 2015 in Prague, Czech Republic. Approximately 30 experts with a wide variety of viewpoints on food systems gathered to review SUSFANS’ Conceptual Framework and Initial Sustainability Metrics. The second SCG workshop took place on 27-28 October 2016 in Brussels, Belgium. The invited experts were updated on the recent developments of the project and shared their views on the potential innovation pathways to address the policy goals for specific case studies in round table discussions (i.e. fruit & vegetables and livestock & fish). The third SCG workshop will take place on 28 September 2017 in Vienna, Austria. Emphasis will be placed on livestock & fish innovations in order to ensure more specific feedback from the invited experts. The potential contribution of the EU agri-food sector to improve the state of EU FNS, when innovating towards ‘SHARP’: Sustainable, Healthy (i.e. nutritionally adequate), Affordable (i.e. accessible yet also supporting the EU agri-food sector), Reliable (i.e. stable in their supply), and Palatable (i.e. consistent with cultural norms and preferences) diets for a range of subregional food patterns. High-level foresight on the challenges for FNS in the EU in the near future (up to 5 years) and on the longer term (one or more decades ahead). For more detailed information on the project, please contact Dr Stéphane Vidry at svidry@ilsieurope.be or Mr Elias Rito at erito@ilsieurope.be.